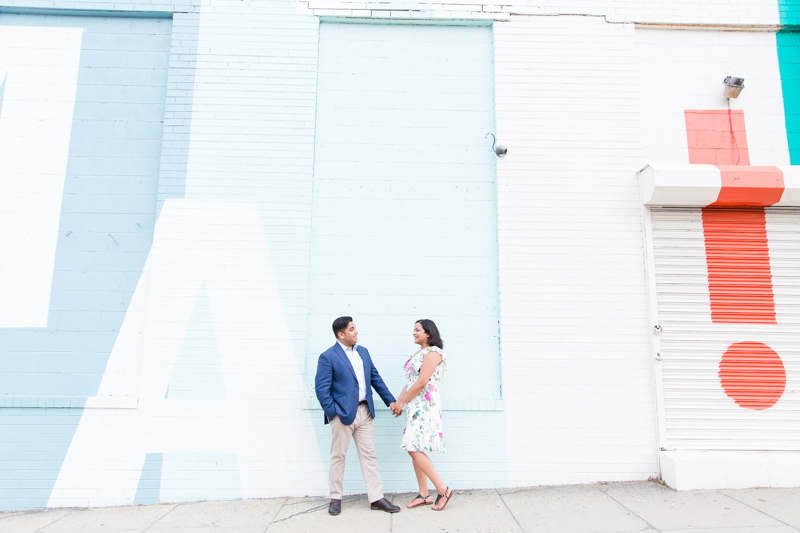 We are smitten with today’s surprise Union Market proposal! When today’s photographer, Megan Rei Photography shared it with us, we knew we had to feature it. From the adorable couple to the hidden photographer and the vibrant colors, we loved it all. 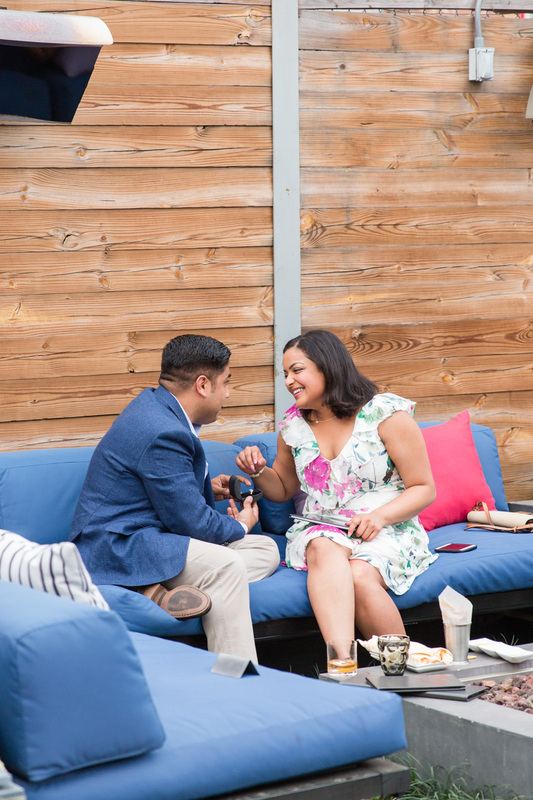 For this Washington, DC proposal, Vedant made dinner reservations for himself and Sneha at Masseria, and looped the restaurant staff in on his proposal plans. 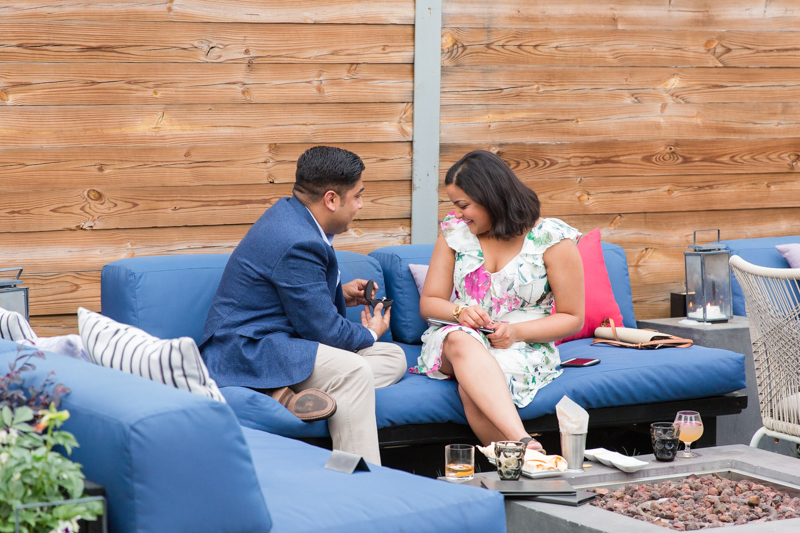 As Vedant and Sneha had drinks in the lounge area, Megan acted like she was taking photos for the restaurant until she got the signal from the Masseria staff. One of the waitresses brought a “menu” to the table. 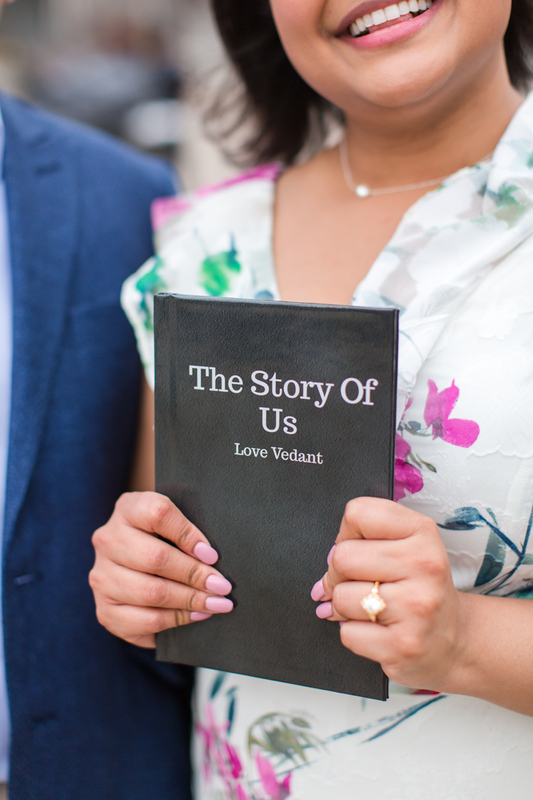 It was actually a children’s book that Vedant had designed to tell their love story! Isn’t that so adorable?! 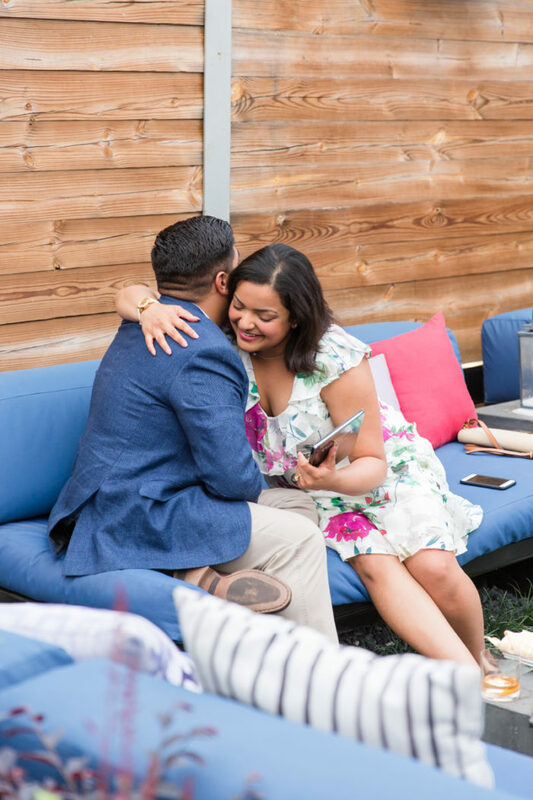 He then popped the question and Megan was there to capture every sweet moment. Afterwards the three of them walked over to Union Market to get photos. 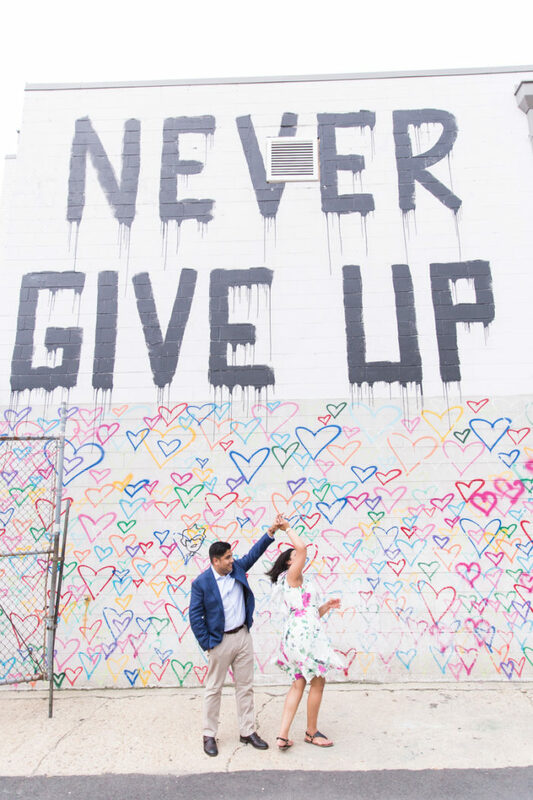 After photos by the iconic heart wall and Never Give Up mural, they stopped for ice cream as well. 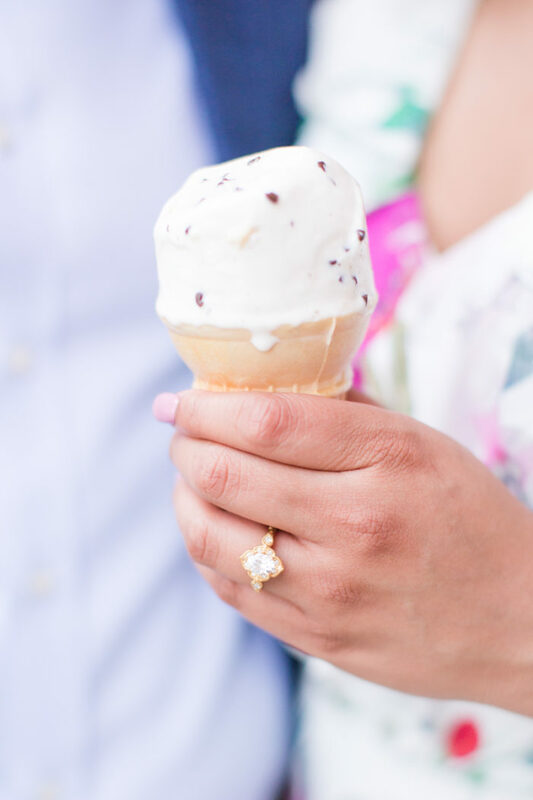 What’s better for the background of shots of that new bling than an ice cream cone? Nothing! Give us all the details about the proposal. 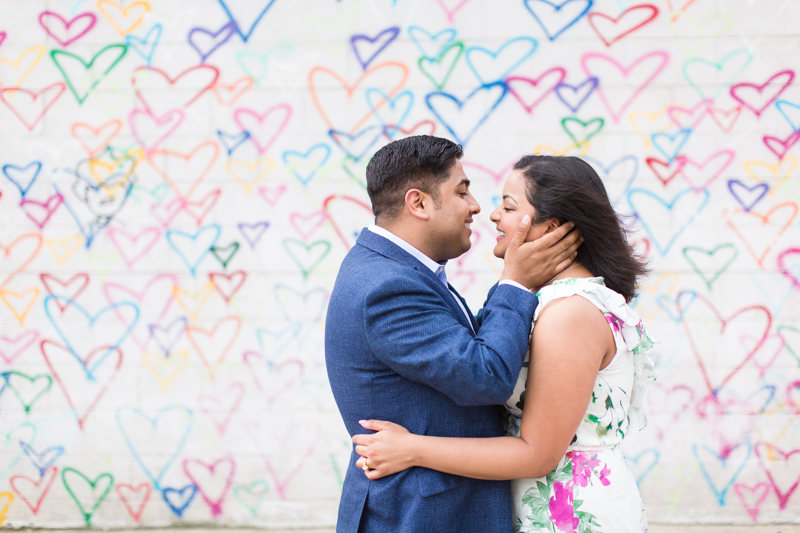 Vedant: I knew I wanted to create something that we could keep. 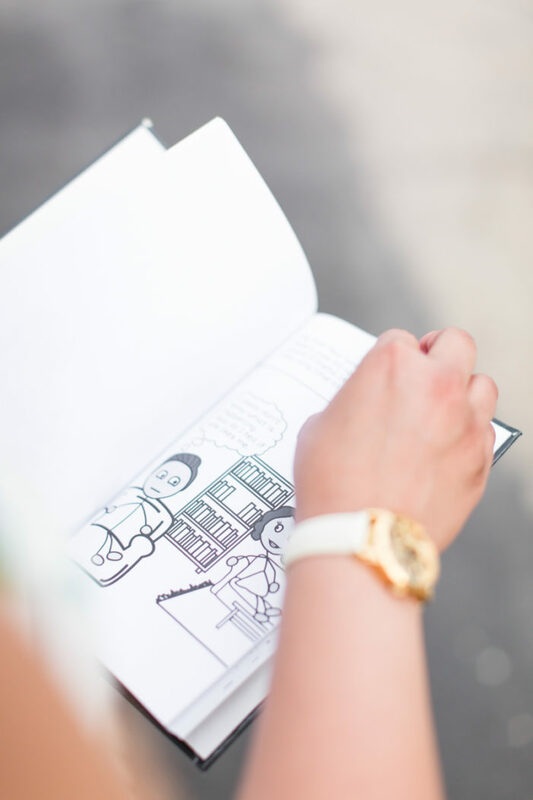 Sneha is a very nostalgic person and what could be more nostalgic than a children’s book? So I made a children’s book with illustrations about how we met. After that I did some research on how to best get her the book and I figured it would be really great to do it a restaurant and have it be a complete surprise with a waitress bringing it out. 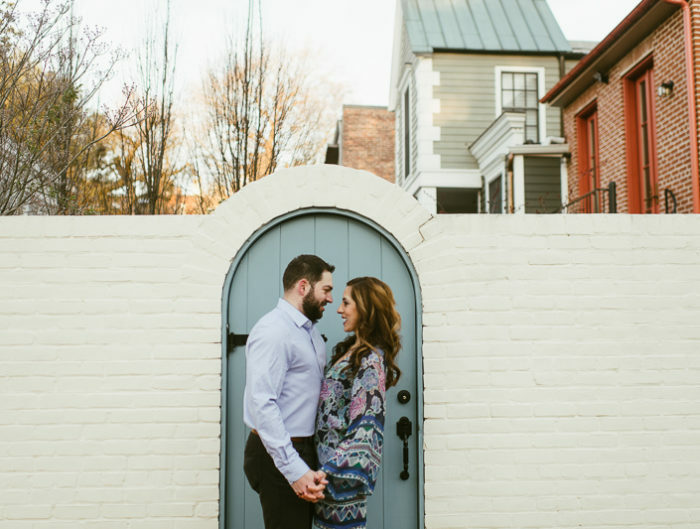 We’d talked about going to Masseria for a long time so it seemed like a perfect place! Sneha: I totally knew the proposal was coming. My mom, my sister, family friends, friends and even the waiter at the restaurant were being so suspicious. 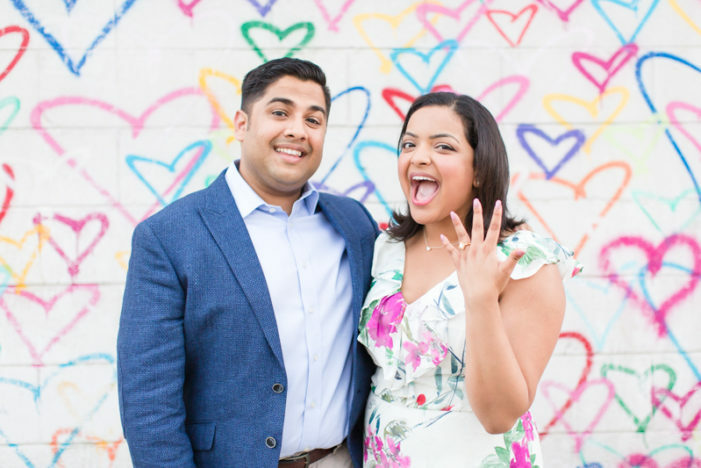 I had no idea how he was going to propose though so that was a complete surprise! I am an incredibly nostalgic person so he couldn’t have picked a better way to propose. How did you know your partner was the one? When did you first know this in your relationship? 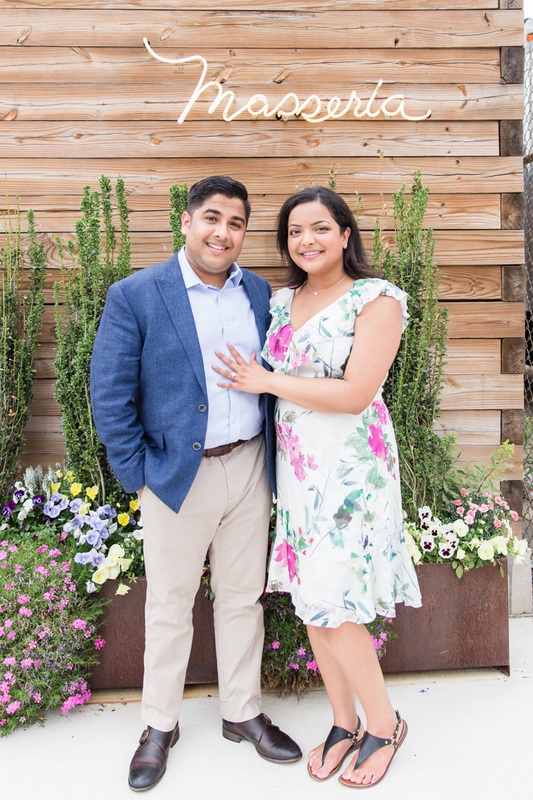 Sneha: I was really impressed by how loyal he was to his friends and family, he’s also incredibly hardworking and passionate about making the world a better place. 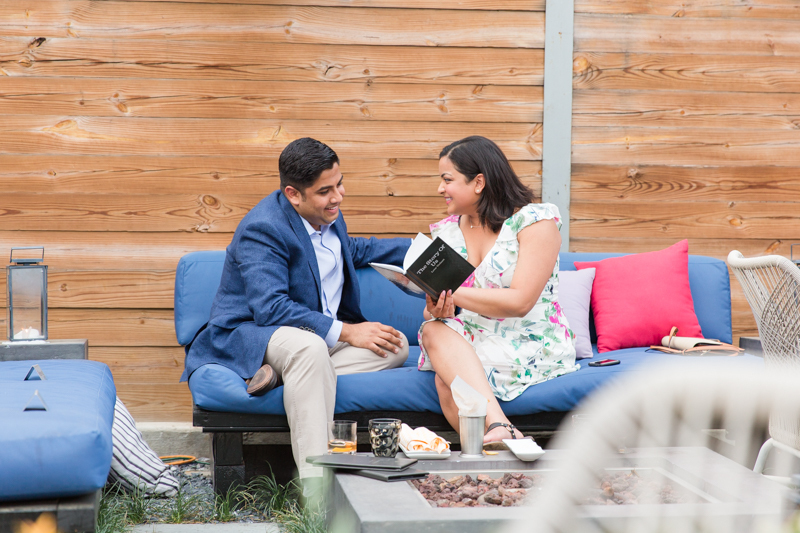 Life is tough at times, but having a loving and supportive partner like Vedant makes it easier. 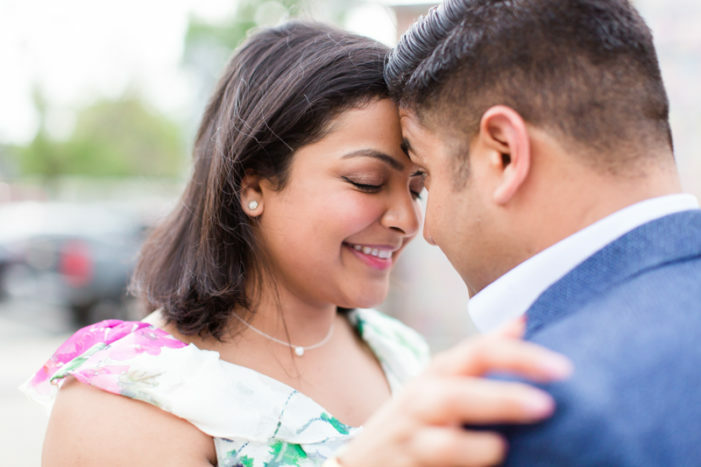 Vedant: I was immediately drawn to Sneha’s compassion and big heart and quickly realized she was the type of person I wanted to build a life with. We just fit together like puzzle pieces. Life’s challenges and ups and downs and the uncertainty seem a lot more do-able with Sneha besides me. We’re all about the bling… Tell us all about that ring! 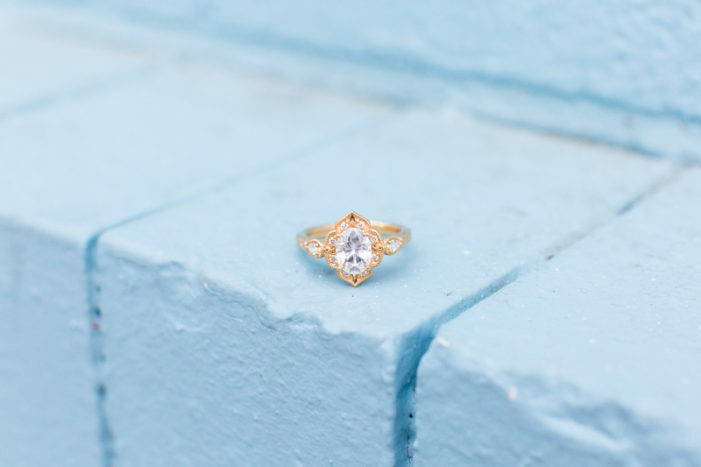 The ring is a custom design by Isabel Bond, a jeweler based out of California. A good friend recommended the designer, Erin. They had their engagement ring designed by Erin as well. 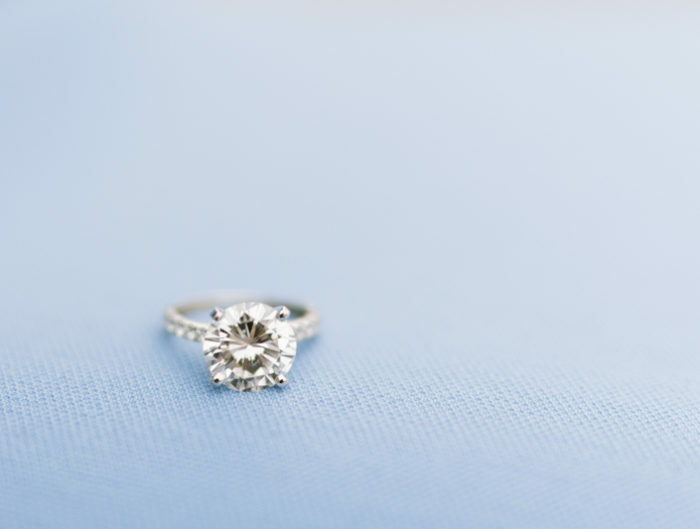 She worked very closely with us over the span of two months to design the ring. She was so patient and understanding, and over 40 emails later we arrived at the perfect design. We couldn’t be happier with the ring. It is absolutely beautiful!